Before the match China looked to be well and truly out of World Cup qualification opportunity sitting eight points off qualification, but the win over South Korea has dragged them within four points of a play off with four games to play. 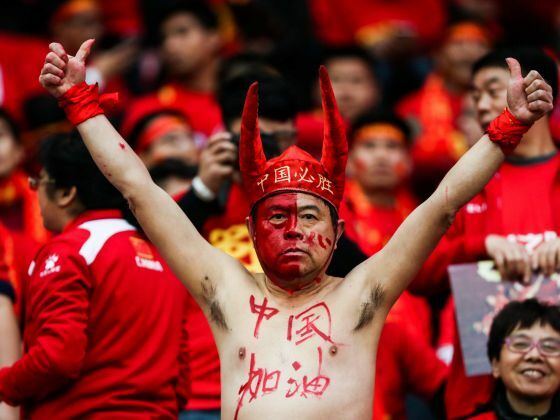 A win for China in tomorrow’s match away to group topping Iran (who China drew with in the opening game of final round 2018 qualifying), could conceivably put them with a game of a play-off place. For the South Korea game more than 70 million Chinese watched at least part of the game on television – making it the highest sports audience reach in 2017 and one of the most watched sports programmes on CCTV in China over the past five years. The game was also streamed on PPTV which reported an all-time high live audience of 12.6 million and more than 25 million video views. The CCTV viewing pattern showed a peak of 41 million Chinese viewers in the second half with average viewing time per viewer lasting about 50 minutes. With social media driving the audience, CSM Media Research data calculated the match drew about q5 million new viewer in China, with viewing levels increasing after Yu Dabao scored a header which gave China a first half lead. The Asian Football Confederation (AFC) has been experiencing major commercial and broadcast growth across the region for its national team and club competition products. AFC General Secretary Dato’ Windsor John said: “Asia is home to the world’s largest football audience and this historic achievement illustrates the strides we are making to achieve the AFC’s Vision and Mission to ensure football remains the most popular sport in the continent.